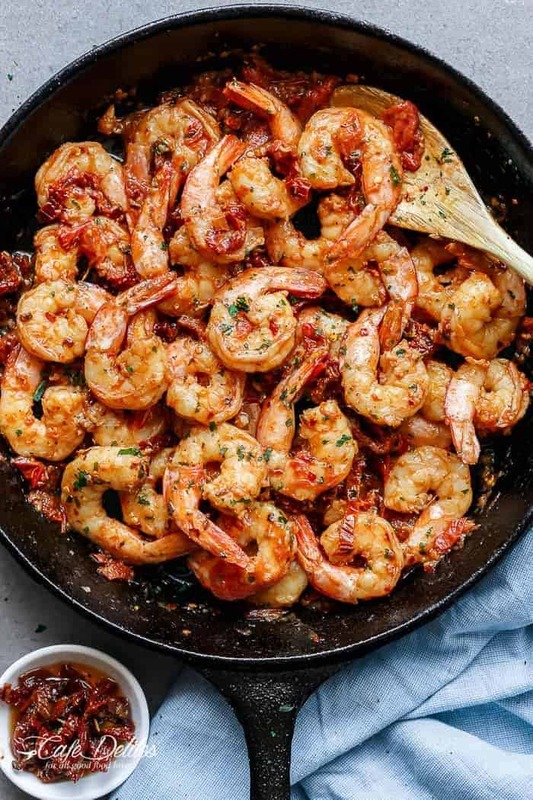 This Spicy Garlic Sun Dried Tomato Shrimp recipe came and knocked me over the head while I was avoiding my kitchen and the build up of dishes that were occurring in two sinks. 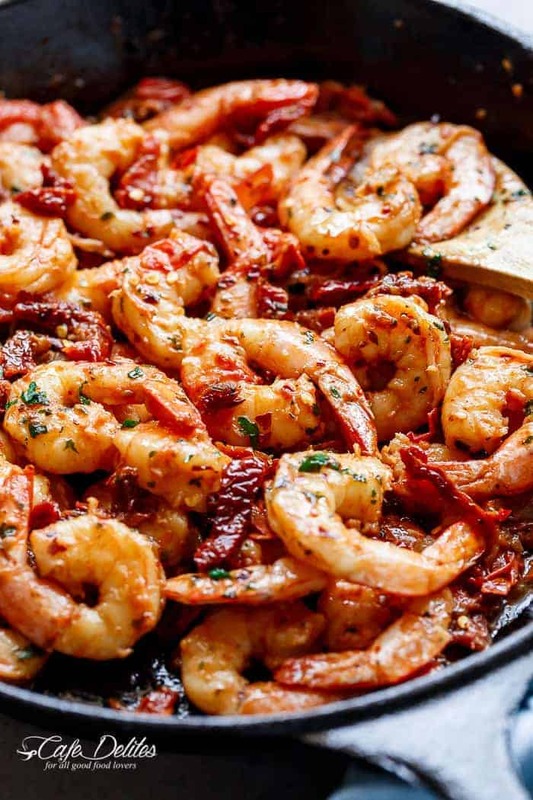 How much more flavour could shrimp have? 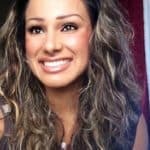 Now this… is… amazing! 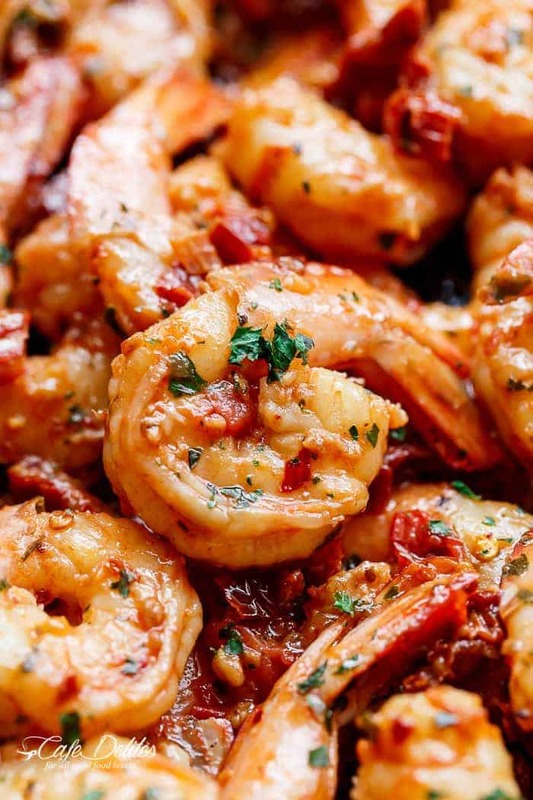 Spicy Garlic Sun Dried Tomato Shrimp, I love you! This is the picture of some serious flavoured shrimp right here (or Prawns, depending on what country you’re here from). Spicy and garlicky with the subtle sweetness of sun dried tomatoes mixed in with fresh, sweet grape tomatoes…this is my happy place. 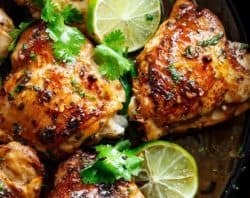 The best kind of recipes are those with minimal ingredients that take less than 10 minutes to cook, while tasting absolutely incredible. Do you agree? I’ll just answer ‘yes’ and save you the trouble. Sun Dried tomatoes are a much loved ingredient on this blog ⇒⇒ Creamy Sun Dried Tomato + Parmesan Chicken Zucchini Noodles ⇒⇒⇒ Sundried Tomato and Garlic Roast Lamb ⇒⇒ Sun Dried Tomato Cheesy Meatballs. If I can figure out a way to include them into a recipe, I will. 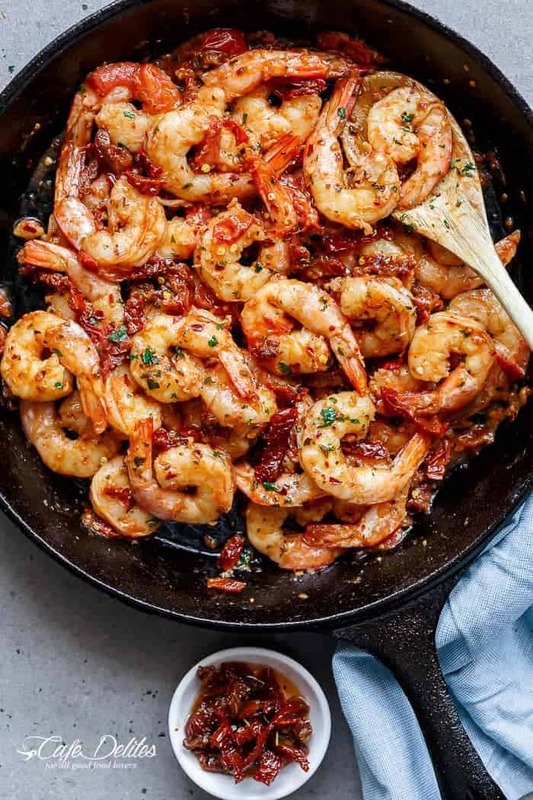 Okay so this is how it started off… A bag of shrimp was defrosting on my counter — next to the two sinks of death with dishes– because I felt like eating shrimp, only I was about to complicate my life with a recipe that had over a million steps in my head. Which is why I was avoiding my kitchen at all costs. 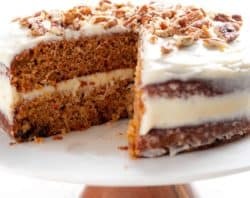 Then, I remembered this recipe. 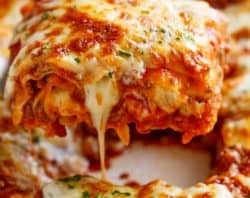 A recipe I’ve cooked so many times before and never thought to include on this blog. I’m sorry. It’s not that I forget on purpose. It’s chemo brain that plagues me to the point of forgetting everything (including washing dishes). The best part is it all takes less than 10 minutes, and is only a matter of frying, stirring and eating. Plus, it’s extremely versatile. Serve it with anything that makes your heart sing. From rice to pasta, zucchini noodles or vegetables, even on toast (don’t judge me). If you can find good quality fresh shrimp, even better. When searing this shrimp, I prefer to sear it in small batches to make sure they’re crisp-tender, instead of simmering them in the sauce. Either way, whichever method you choose, the flavours are still amazing. 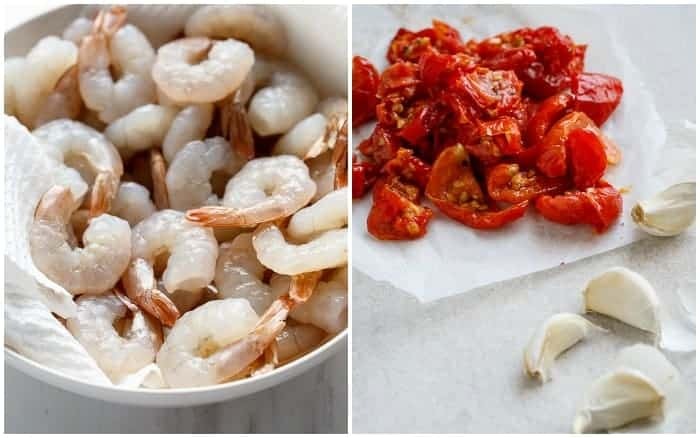 The other thing I love to do is use a combination of grape (or cherry) tomatoes that add a subtle sweetness to these shrimp, without using a whole jar of sun dried tomatoes. Finally, garnishing with basil before serving compliments the sun dried tomato flavours. 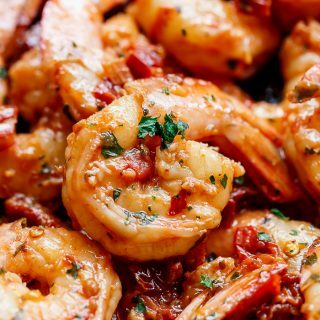 Spicy and garlicky with the subtle sweetness of sun dried tomatoes, this Spicy Garlic Sun Dried Tomato Shrimp takes less than 10 minutes! Heat 2 teaspoons of the reserved sun dried tomato oil in a large skillet or nonstick pan over medium-high heat. 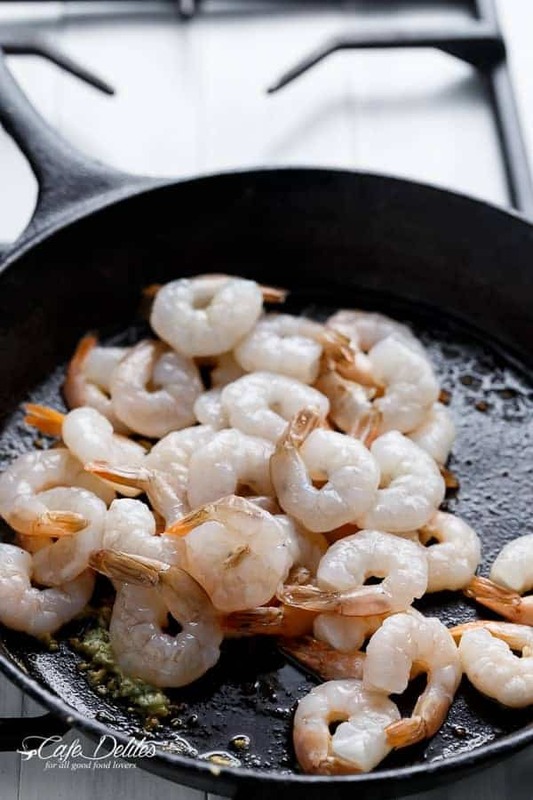 Add the shrimp in small batches, frying each batch for 1-2 minutes each side until they are just cooked through. Do not over cook them, or they will be rubbery. (or if you prefer, fry them all at once). Remove each batch to a plate and once they're cooked, and set aside. Heat the remaining 2 teaspoons of the reserved oil in the same skillet. Add the garlic and fry until fragrant (about 30 seconds). Add the sun dried tomatoes and grape / cherry tomatoes, salt and red pepper / chili flakes. Cook, stirring a few times, until tomatoes begin to soften (about 2-3 minutes). Return shrimp back into the skillet and heat through. Stir in basil (or parsley). 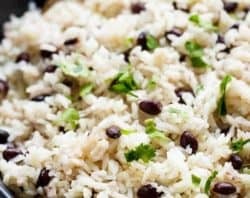 Remove from heat and serve immediately over pasta, rice, cauliflower, rice, mashed potatoes, smashed potatoes or vegetables. *When draining your sun dried tomato strips, reserve 4 teaspoons to use in cooking. 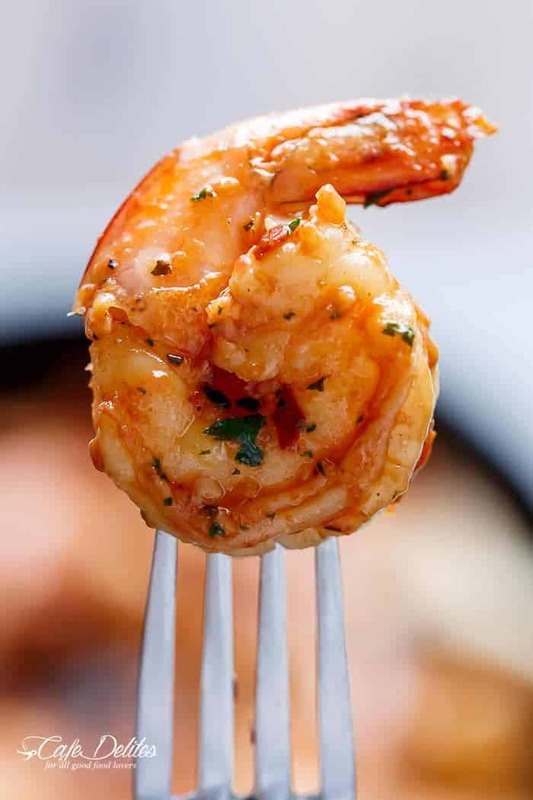 This adds extra flavour to the shrimp. If you don't wish to do this, simply use olive oil or your oil of reference. Sounds like this might make a good cold appetizer too. 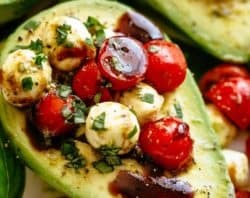 I’m always looking for appetizers to bring on boat that doesn’t require cooking, or heating up, just refrigerating until people get hungry. 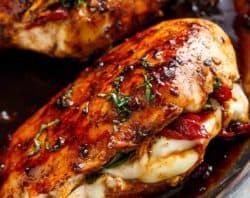 Great tasting recipe that is very quick & easy to prepare! Looks so good! spicy sea-food is amazing and not as popular as I wish it were. Copied!